MaxGEE Stay Clean applies an ultra thin polymer layer to the glass, making the surface far smoother on a microscopic level. This results in water, dirt and grime struggling to stick to the glass surface. Your windows will remain cleaner for longer. Simply spray on and wipe in with a paper towel, and then polish off with a fresh paper towel. Don't apply in direct sunlight or hot conditions, and apply to small areas at a time to ensure a good finsih. 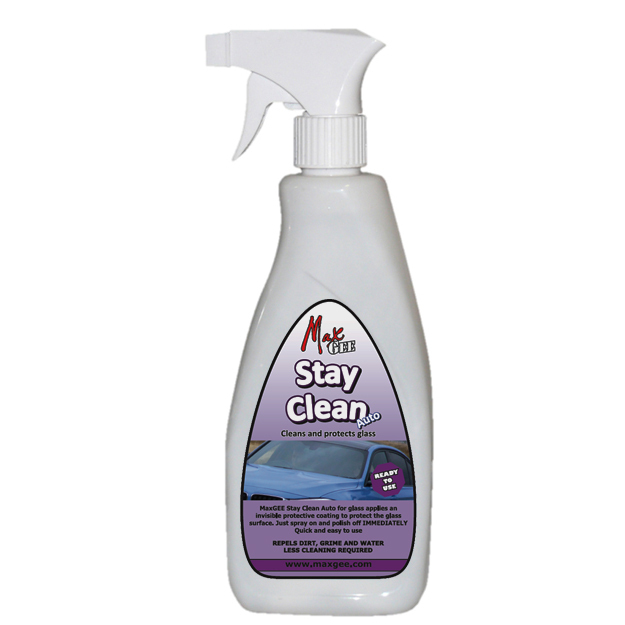 MaxGEE StayClean for Glass Auto contains NO acid or vinegar and has been developed to clean all glass inside or out quickly and efficiently, without leaving any streaks or smears that are usually associated with glass cleaning. MaxGEE StayClean for Glass is also a highly effective hard surface cleaner for use inside and out, around the home and garage. Application suggestions - Easy to use. MaxGEE StayClean for Glass is ready to use straight from the bottle. The non-acidic formulation is easier and safe to use.